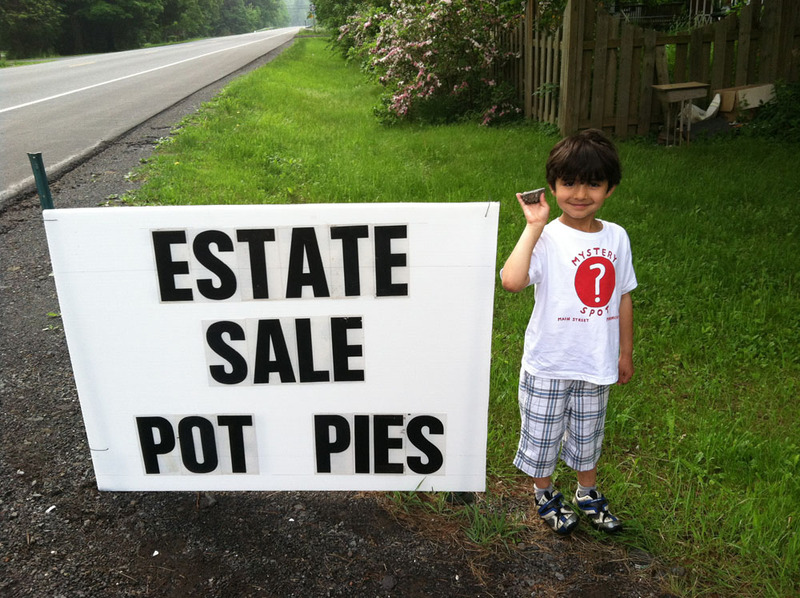 Presidents’ Weekend Vintage Sale in Phoenicia, NY! Hey, phellow Phoenicians! Hey you, coming up to the Catskills! Vintage hunters! Road trippers! 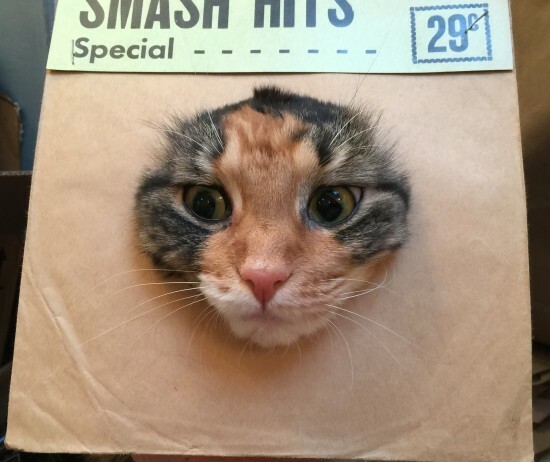 Crate diggers! Vintage clothing pickers! Brookyn babies! NYC getaway cars! We’re briefly coming out of hibernation for ONE WEEKEND ONLY, this upcoming Presidents’ Day Weekend, with a 20% off sale here on Main Street. We hope to see all our friends and customers, new and old. We promise lots of estate-fresh goodies to paw through! And all of it is 20% off! Then we’re back to hibernating a little bit more before we re-open this spring for our FIFTEENTH SEASON! Yes, we’re hibernating! But please check back as we may open for holiday weekends over the winter (i.e. Presidents’ Day Weekend). Thank you, everyone, for being the best customers, ever! 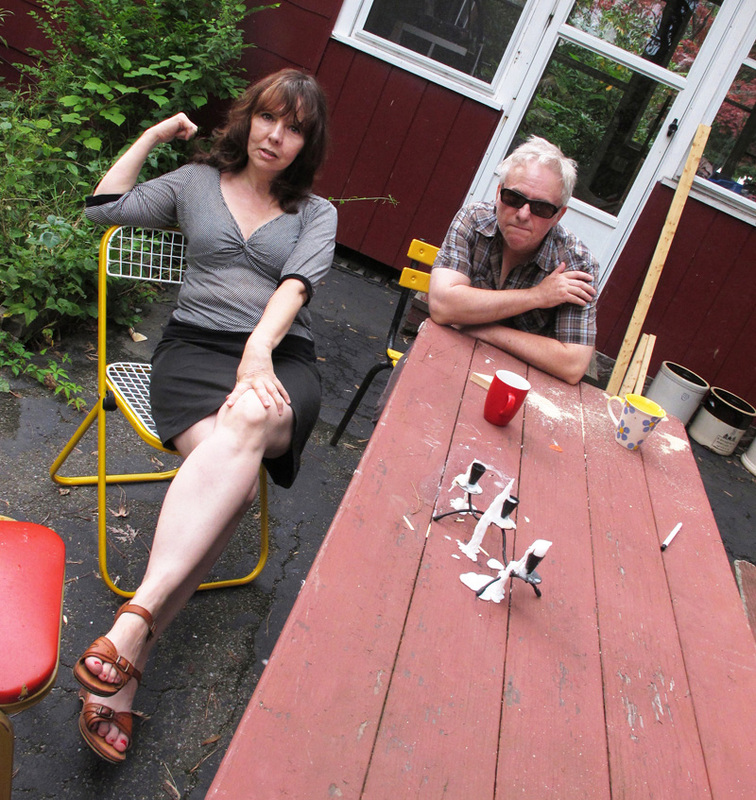 Wreckless Eric & Amy Rigby play the Mystery Spot, Labor Day Weekend – Free! Can you think of a better way to spend a summer afternoon than hanging out in front of a vintage shop under the shade of a twelve foot statue of Davy Crockett watching a live performance by Wreckless Eric & Amy Rigby on the front porch? We sure can’t! The artists are Wreckless Eric & Amy Rigby. 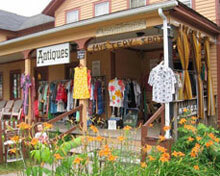 The place is vintage/vinyl shop Mystery Spot Antiques. The town is Phoenicia, NY, in the Catskill Mountains. The annual tradition is Music for Front Porches. The cost is absolutely FREE, and everyone is welcome. Wreckless Eric & Amy Rigby have been performing and recording together since 2006, releasing three critically-acclaimed albums and touring North America, the UK and Europe. He is the British pop legend of Stiff Records’ fame whose classic “Whole Wide World” is covered in basements and stadiums around the world; she a long-time NYC songwriter and musician best known for her album “Diary Of A Mod Housewife” and Underground Garage favorite “Dancing With Joey Ramone.” (You can read more about them here). Previous Music for Front Porches performances presented by The Mystery Spot have featured Mercury Rev and Dean + Britta, Laura Cantrell, Gail Anne Dorsey, Tommy Ramone and Claudia Tienan (Uncle Monk), Alessi’s Ark, Ambrosia Parsley and Holly Miranda, to name just a few. (Always free). Our Dittypalooza! Mystery Ditties include new releases by Steve Wynn (The Dream Syndicate/Baseball Project), Tommy Ramone and Claudia Tienan, Ambrosia Parsley, Holly Miranda, and Alessi’s Ark. In the can and still to come: How Gelb (Giant Sand) and David Fair (Half Japanese). Again, all free to download – our gift to you! Lookalike Contest, Valuable Prizes, Free Refreshments, and more – Saturday Aug. 17th at High Noon – FREE! 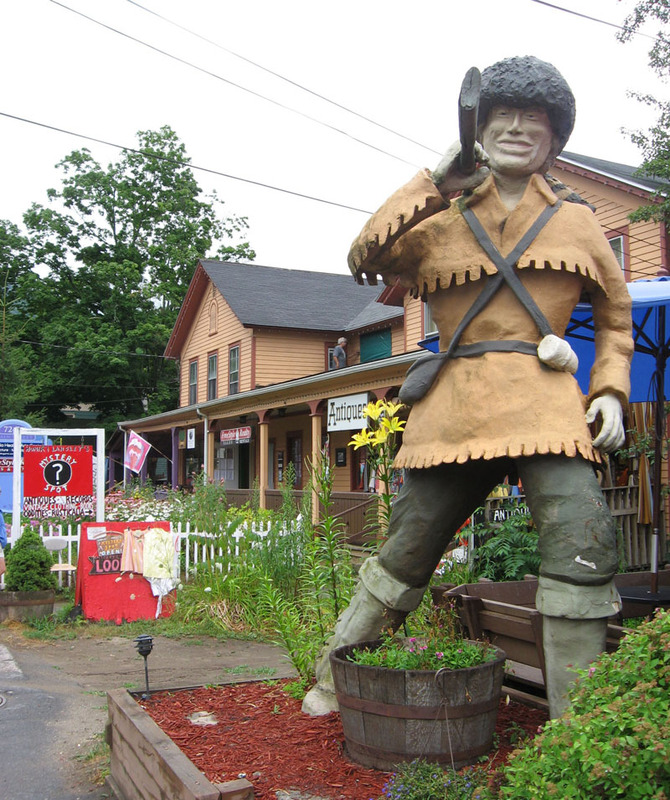 On Saturday, August 17, at 12 noon, the statue of Davy Crockett, who for forty years has towered above the two block long Main Street of Phoenicia, New York (pop: 309) as its village mascot, will be re-erected in front of Mystery Spot Antiques at 72 Main Street with a gala celebration to mark the American folk hero’s return (and 227th birthday). The free event will include an official dedication/ribbon cutting, a performance by the Catskill Ukulele Group, and a Davy Crockett lookalike contest open to kids, adults and pets, with valuable prizes. “Bring your faux coonskin cap and dress up like Davy!” invites Laura Levine, renowned (and MoMA-exhibited) rock photographer and proprietress of Mystery Spot Antiques, Davy’s new home, just one giant step away from his former perch at the Sportsman’s Alamo Cantina. The grand prizes will be two passes to the Mount Tremper Arts 2014 Summer Festival (value $190.) or a $100 Mystery Spot gift certificate; runners-up will receive valuable gift coupons or cash prizes from Tender Land Home, Town Tinker Tube Rental, Hanover Farms, the Phoenicia Lodge, Ruth Gale Realty, Sweet Sue’s, The Ice Cream Station, and other local businesses. The event is free of charge, and open to everyone. Free refreshments will be provided by The Sportsman’s Alamo Cantina. The event will run from noon to 1 pm. at Brio’s or stacks of pancakes at Sweet Sues. The Phoenicia International Festival of the Voice attracts over 4,000 visitors to its annual outdoor event. Close to Woodstock, one of the oldest art colonies in America, Phoenicia has been chosen as one of the Top Ten “Coolest Small Towns” by Budget Travel magazine and has long been a well-known secret among savvy New Yorkers looking for a weekend getaway or a summer escape. Davy Crockett, who bears the sobriquet “King of the Wild Frontier,” was born in East Tennessee in 1786. He had a varied career as frontiersman, Congressman, and warrior at the Alamo, where he died in 1836. Phoenicia’s statue of Davy Crockett is shrouded in mystery. Most local historians agree that it was commissioned by Roy James, transitory owner of the Sportsman’s Bar sometime in the early 1970s. The actual fabricator of the sculpture is unknown. With a wide smile, slightly downcast eyes, a rifle slung jauntily over his right shoulder, Davy strides forward. The straps from a pouch and a powder horn form an X across his buckskin breeches. Beneath his double row of fringes, Davy wears pants and high boots on his large feet — large even for a 10 foot tall man. The huntsman has surprisingly long hair, like a British pop star. The anonymous artist conveyed a jauntiness rarely seen in fiberglass sculpture, which tends towards an Easter Island rigidity. It is the statue of a man taking joy in his personal freedom. Phoenicia has long been a favorite spot for outdoorsmen, which may have influenced the choice of Davy Crockett as its town symbol. “Young kids like having their picture taken in front of it,” notes Robin Kirk, owner of The Nest Egg, Phoenicia’s general store. Such sculptures — collectively known as “Muffler Men” — are an endangered American art form, especially in the Catskills. Widely constructed in the 1960s and 70s, often depicting such national folk heroes as Paul Bunyan and Uncle Sam, they since fell out of favor, and were largely abandoned. Phoenicia’s statue of Davy Crockett will feel at home with the rustic salt-and-pepper shakers, bronzed baby shoes, vintage clothing, antique medicine bottles, old records and 1920s cameras for sale at the Mystery Spot, the “Catskills Odditorium” which occupies seven rooms in the former Gormley Hotel on Main Street. “One small step for Davy Crockett, one giant leap for the Mystery Spot!” observes Levine, who is throwing a 20 % off sale all weekend in honor of the event. After the celebration ends at 1 PM, one can walk across Main Street to attend one of seven episodes of Perfect Lives, a day-long public opera by Robert Ashley, performed by the composer collective Varispeed, presented by Mount Tremper Arts. The Catskill Ukulele Group, which will be performing “The Ballad of Davy Crockett” at the event, is an offshoot of the Killian Mansfield Ukulele Collection at the Phoenicia Library, which loans ukuleles and offers free group lessons to anyone interested in learning more about ukulele. The Phoenicia Library also loans out fishing poles. Generous support for Davy Crockett Day has come from the Sportsman’s Alamo Cantina, Mystery Spot Antiques, Tender Land Home, Phoenicia Lodge, Threads of Time, Phoenicia Belle B&B, Ulster Savings Bank, Phoenicia Pharmacy, Hanover Farms, The Print Shop, Ruth Gale Realty, Mount Tremper Arts, Rag & Bone Shop, The Ice Cream Station, Sweet Sue’s, Town Tinker Tube Rental, and the Phoenicia Business Association, among others. Mystery Spot Antiques’ free Music for Front Porches series kicks off its 2013 season with a special acoustic performance by Alessi’s Ark (Alessi Laurent-Marke) this coming weekend. 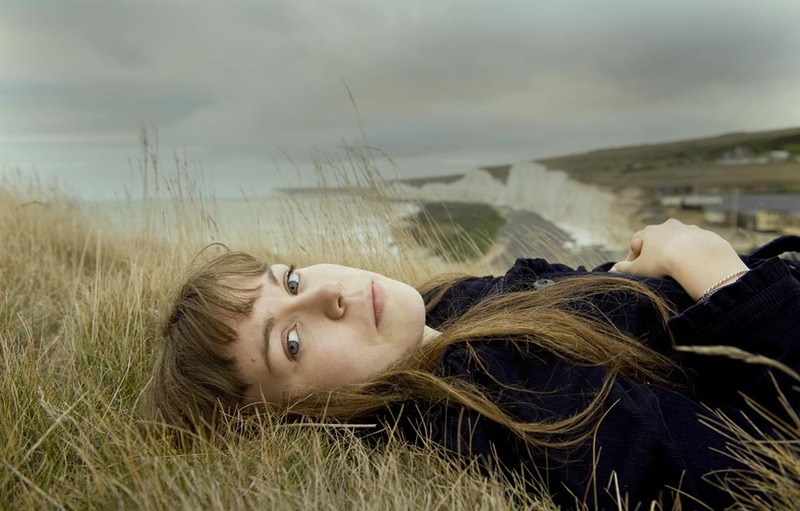 We’re thrilled that Alessi is flying over from London for a US tour in support of her wonderful new album The Still Life, and that her first stop will be the Catskills hamlet of Phoenicia NY, to perform on our front porch on Saturday, June 1st. The music starts at 1 PM and all are welcome. As with all of the shows presented by the Mystery Spot these past few seasons, it’s absolutely FREE, made possible through DIY/grassroots efforts and the generosity of the performers. All are invited. Mystery Spot by Alessi’s Ark. 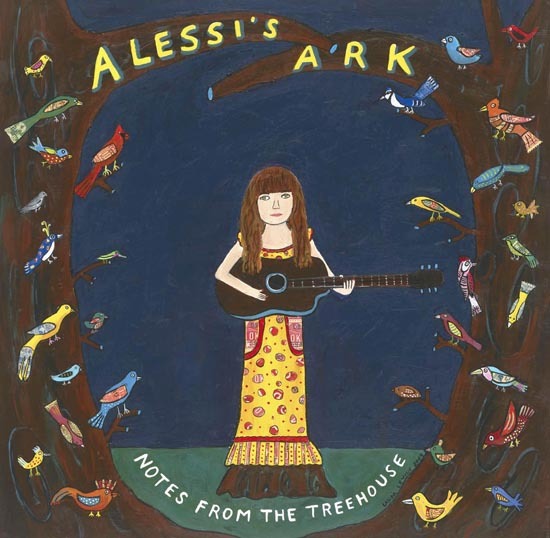 Alessi first began writing and performing at the age of sixteen, and was quickly signed to Virgin/EMI, recording her debut album Notes from the Treehouse (produced by Mike Mogis/Bright Eyes) when she was eighteen. In fact, Mystery Spot proprietress/artist Laura Levine was commissioned by the record label to paint the album’s cover art, which is how she and Alessi first met. Travel, adventure and personal revelation mark the body of work by Alessi Laurent–Marke. Now the ripe old age of 22, having performed with Robyn Hitchcock and toured with Laura Marling and Mumford and Sons, Alessi’s newest album, The Still Life, is a work both lucid and heartbreakingly lovely, a sonic landscape that roams a wide range of emotions, with (as the songwriter explains), “Nature and love, as common threads”. ‘The Still Life’ is out now in the U.S via Bella Union. 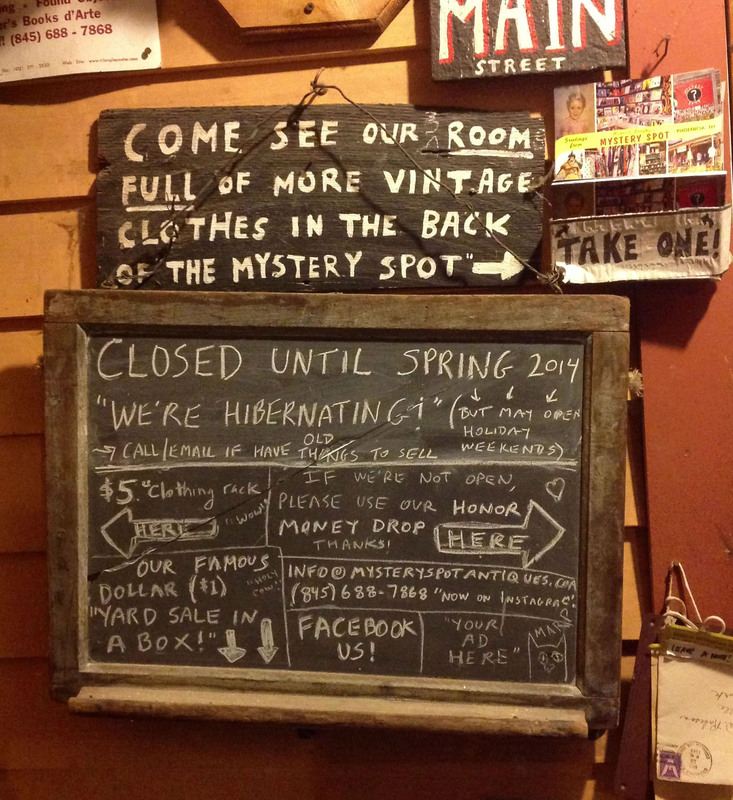 Now in its 12th season, Mystery Spot Antiques is a ramshackle (but surprisingly organized) vintage shop run by artist/photographer Laura Levine, housed in a former 1800’s hotel on the Main Street of Phoenicia, NY in the Catskill Forest Preserve. Long a favorite haunt of vintage clothing lovers and vinyl diggers, Homer and Langley’s Mystery Spot Antiques is the kind of vintage shop you didn’t think existed anymore. Part museum/part odditorium, every nook and cranny of its seven rooms is packed to the rafters with 100% vintage goodness. Named after the world’s most famous hoarders – and role models – the Collyer Brothers (who were tragically crushed under their 136 ton accumulation of “collectibles”), this unusual and beloved “shrine to clutter” is home to an amazing array of hand-picked vinyl records, tons of vintage clothing, Forties housewares, antiquarian art books, Rusticalia, mid-century lighting and found objects, and draws fans and repeat customers from all over. Even when the doors are closed, customers with a yen to shop at 3 AM are welcome to dig through the dollar record bins and famous Yard Sale in a Box on the front porch, with an honor money drop at your service. Proprietress Laura Levine, a Soho-based artist/filmmaker/ photographer, opened The Mystery Spot in 2001 as an outlet to contain the overflow of vintage items collected at weekend yard sales, flea markets and country auctions. In addition to her burgeoning career as a junkmonger, Levine is known primarily as a highly regarded photographer and documentarian of the downtown NYC music scene in the 1980s and early 90s. She was the chief photographer and photo editor of the New York Rocker and shot for numerous publications at that time including the Village Voice and the New York Times. As an artist, her primary focus has since evolved into a cross-disciplinary visual practice spanning painting, illustration and animation to directing music videos and documentary film. She has published three children’s books and she made her directorial debut at at the Sundance Film Festival. Levine’s photographs have most recently been exhibited at the Museum of Modern Art, the Annenberg Space for Photography, the Steven Kasher Gallery, and the Brooklyn Museum, and are in the collections of the Museum of Fine Arts, Houston, and the Smithsonian Institution’s National Portrait Gallery. Previous Music for Front Porches performances have featured Mercury Rev and Dean + Britta, Laura Cantrell, Gail Anne Dorsey, Tommy Ramone and Claudia Tienan (Uncle Monk), Ida, Ambrosia Parsley and Holly Miranda, to name just a few. Upcoming Dittypalooza! Mystery Ditties this season include new releases written for and about The Mystery Spot by Steve Wynn (The Dream Syndicate/Baseball Project), Howe Gelb (Giant Sand), and David Fair (Half Japanese). You can hear previously released ditties (Holly Miranda, Ambrosia Parsley and Uncle Monk) at www.dittypalooza.com. Again, all free to download! Travel note: As always, please contact us first if you’re planning to come from a distance, just to make sure there are no last-minute scheduling changes. We Interrupt Our Winter Hibernation in Order to Announce…. 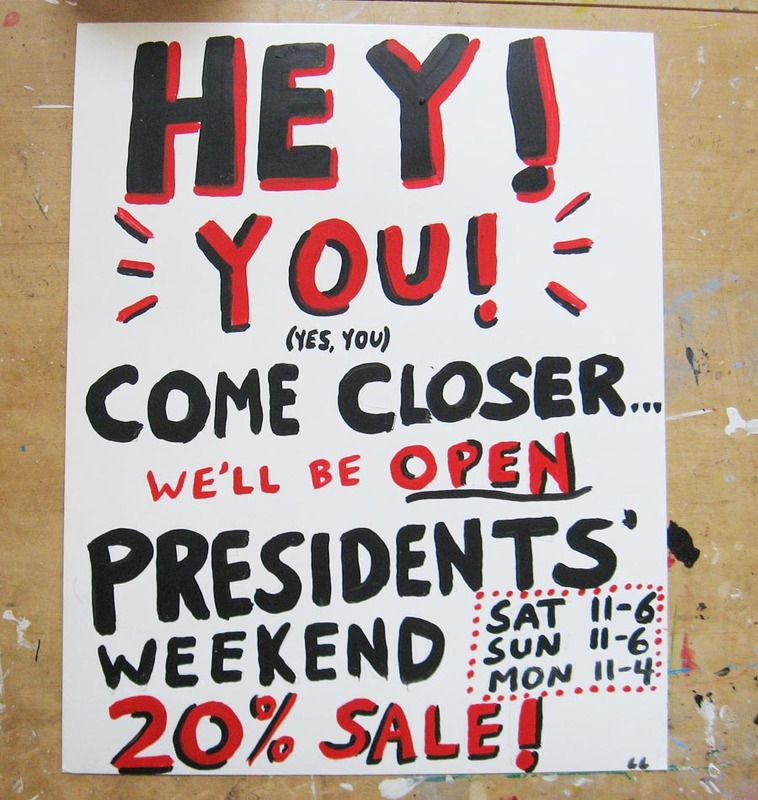 Presidents’ Day Weekend Sale at Mystery Spot Antiques in Phoenicia. Everything vintage 20% off. Boo! 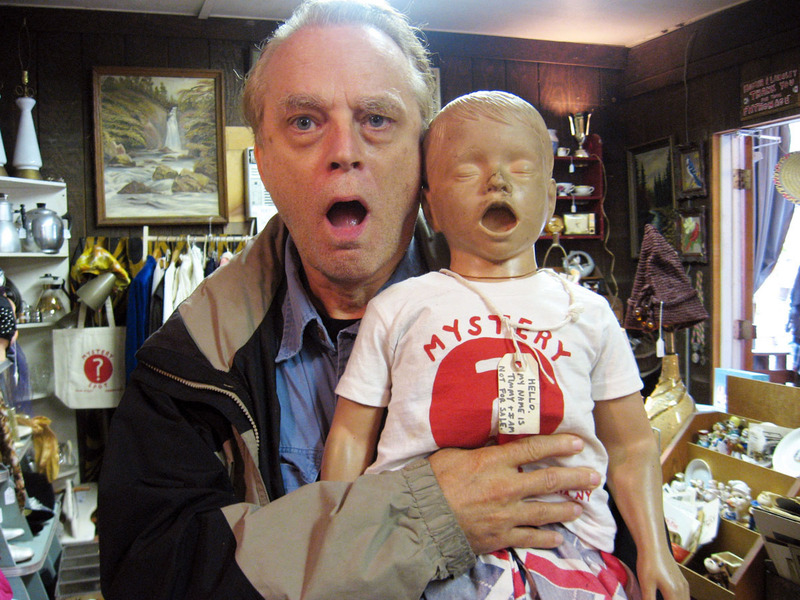 Halloween greetings to you all from actor Brad Dourif, who bonded with Timmy the CPR Dummy Factory Reject Doll when he visited The Mystery Spot in Phoenicia recently. If you’ve seen any of Brad’s CHUCKY movies you’ll understand their special connection. Brad, as you probably know, is one of the stars of Deadwood, and he tipped us off that he’ll be the “Unsub” in an upcoming episode of Criminal Minds (We can’t wait!). His list of credits is mind-blowing, from Blue Velvet to One Flew Over the Cuckoo’s Nest. Be on the look-out next Halloween for his latest star turn in the Chucky oeuvre, The Curse of Chucky, which will also star his daughter Fiona Dourif. And meantime, be very, very careful out these this Halloween. You never know who you might run into in these Catskill Mountains. Happy Halloween! Mystery Spot Antiques is proud to present…..Dittypalooza! Join us as The Mystery Spot Celebrates its 11th Season with a Slate of Original Rock Star Ditties! Click onto our Dittypalooza! link up top (or simply go to www.dittypalooza.com) where every month we’ll post a brand new original song inspired by The Mystery Spot, written and performed by our favorite musicians. We’re launching the series with a doubleheader by three of the best musicians/songwriters (and by the way, loyal Mystery Spot customers) we know, Holly Miranda and Uncle Monk (aka Tommy Erdelyi Ramone & Claudia Tienan). Who else has generously penned Odes to The Mystery Spot? And there are more surprises yet to come! So keep checking back, sign up for our mailing list to be the first to hear the new songs, and check out the Dittypalooza! page for photos, more details and quotes from the musicians about the songwriting process. Deepest thanks to the musicians who gave so much of their time and talent to contribute to our little experiment. Enjoy! Even the Boxes are a Sight to Behold! 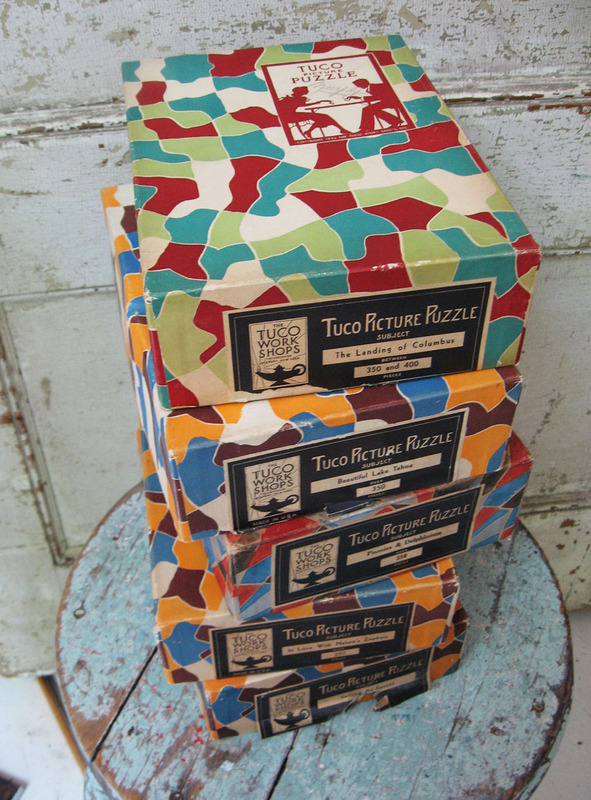 This just in…a stack of TUCO jigsaw puzzles from 1933. Great Art Deco boxes, and the puzzle pieces themselves are thick and what we’d call “challenging” in their shape. We dare ya!